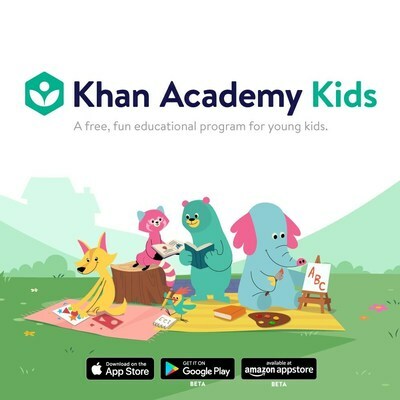 MOUNTAIN VIEW, Calif., July 12, 2018 — (PRNewswire) — Khan Academy announces the launch of Khan Academy Kids, a new educational app for children ages two to five available free for download today. With thousands of original activities, books, videos, and lessons, Khan Academy Kids combines subjects like math and reading with creative activities like drawing and storytelling. Animated characters guide children through educational materials at just the right level for them. As they learn, kids collect bugs, hats, and toys for their favorite characters. "Our goal with Khan Academy Kids is to inspire a life-long love of learning," said Sal Khan, founder and CEO of Khan Academy. "We're delighted to offer a free app that engages children academically and that's also a lot of fun." While many early learning apps focus on a narrow skill area, Khan Academy Kids is a complete learning experience across multiple subjects that is aligned to the Head Start Early Learning Outcomes Framework for preschool-aged children and Common Core State Standards for kindergarten-aged children. It is designed to adapt over the years as a child grows, and includes social-emotional learning. The program was created by Khan Academy's award-winning early learning team, whose educational materials have won 21 Parents' Choice Awards, 18 Editor's Choice Awards from Children's Technology Review, and been voted the best children's app at the International Consumer Electronics Show. The early learning team at Khan Academy collaborated with leading experts in child development to create Khan Academy Kids. In addition to Super Simple Songs® from Skyship Entertainment™, Khan Academy partners with Bellwether Media and National Geographic Young Explorer Magazine to provide free learning materials. Parent participation is a key component of the Khan Academy Kids experience. Parents can engage in learning activities with their child and read books out loud. They can view their child's progress on activities in the Library and set up accounts for multiple children, all for free. Khan Academy Kids is made possible through generous support from Omidyar Network and Windsong Trust. Khan Academy Kids is available as a free download in the App Store and in beta for Google Play and the Amazon Appstore. For more information, please visit Khan Academy Kids. Khan Academy is a 501(c)(3) nonprofit organization with the mission of providing a free, world-class education for anyone, anywhere. We offer practice problems and instructional videos and articles on a range of academic subjects, including math, biology, chemistry, physics, history, economics, finance, grammar, preschool learning, and more. We provide teachers with tools and data so they can help their students develop the skills, habits, and mindsets for success in school and beyond. Khan Academy offers free personalized SAT practice in partnership with the College Board and free personalized LSAT prep in collaboration with the Law School Admission Council. Khan Academy has been translated into dozens of languages, and 15 million people around the globe learn on Khan Academy every month. For more information, visit khanacademy.org,or join us on Facebook, Twitter, and Instagram.